One Ohm Standard | Ohm-Labs, Inc.
Based on the most recent research in materials and processing, Ohm-Labs' Model 200 One Ohm standard is wound from a single length of carefully annealed and heat treated Evanohm wire to produce a state of the art resistance standard. 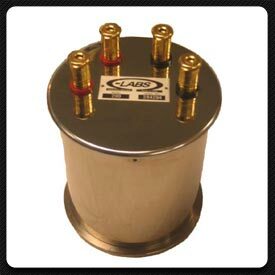 For years, the L&N 4210-B Thomas type one ohm standard has proven itself to be an excellent reference standard. However, these resistors have a relatively high temperature coefficient, a noticeable pressure coefficient, and they often require weeks to stabilize after transport. Based on research performed at national laboratories in the USA (NIST) and Australia (NMIA), the Model 200 One Ohm Standard is designed to overcome these problems. The temperature coefficient of resistance is specified to be less than 0.1 μΩ/Ω/°C, with most resistors well below this value. Oil-filled and hermetically sealed in a heavywalled enclosure, these standards have shown high immunity from changes in barometric pressure and relative humidity. Long term stability data is being collected on initial production runs of these resistors; they appear to be comparable to other standards-grade resistors. Additional stability data will be available in time. The recommended measurement current is 100 mA, but the Model 200 will not be harmed by application of continuous current up to 1 amp, nor by intermittent current (< 1 minute) up to 3 amps. Due to the extremely low temperature coefficient, the Model 200 may be used as the most accurate one amp current shunt. The Model 200 One Ohm Standard's rugged construction allows it to be used as a transport standard. Laboratories using Thomas type one ohm standards can now maintain these resistors in the laboratory and use the Model 200 as a transfer standard to a national laboratory or other reference lab. Repeated shipment by ground commercial carrier, packed in regular bubble wrap and a cardboard box, has shown the Model 200 to be largely immune from instability due to transport. The Model 200 is supplied with ISO17025 accredited calibration, including temperature coefficient data. Ohm-Labs uses the basic design of the Model 200 One Ohm Standard for a series of resistance standards, including –T values for thermometry, and –Q values for use with a Quantum Hall System. Temperature coefficient is at nominal 25 °C +/-5 °C.